Happy Monday everyone! First let me start off the day by saying wasn’t this weekends weather just wonderful? 🙂 Spring is almost here, and so is St. Patrick’s day! 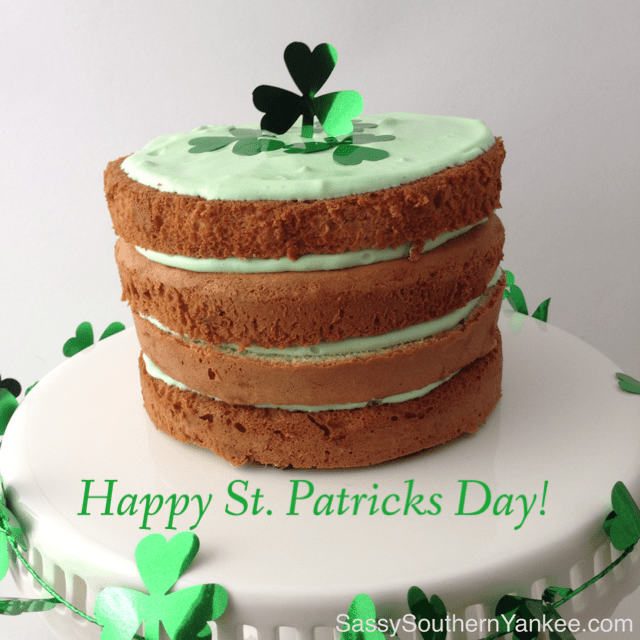 I figured with the time change this past weekend it would be nice to have a sweet treat to share on St. Patty’s day that would be quick, and easy allowing for a bit more shut-eye. 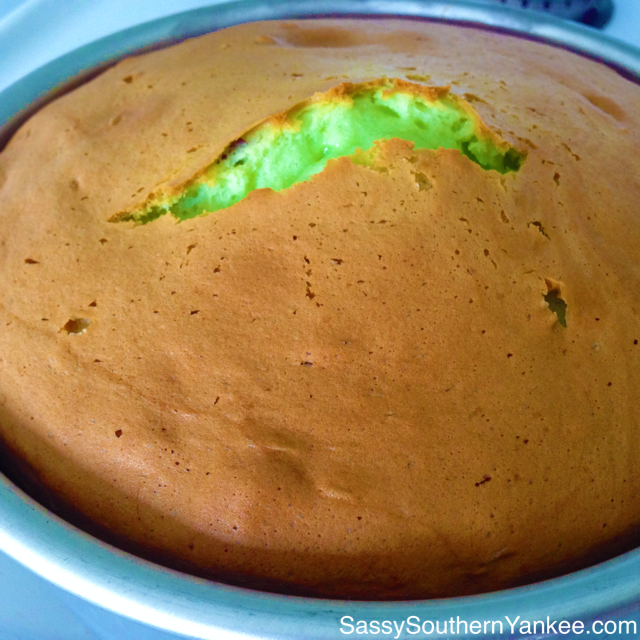 This pistachio cake is light, not too sweet plus its bright and cheery with the pale green. If you have little ones they will love watching the Leprechaun’s “magic” when the milk hits the pudding turning the cake a bright green. I’m going to start off by admitting that today we are going to cheat a bit for the recipe. I’ll be the first to say that homemade food is great, but sometimes you just need to cheat and save yourself a bit of time. I’m not opposed to boxed cake mix in fact I have learned over the years that you can tweak it a bit and make it the most amazing moist cake around. Rule number one always add an extra egg, rule number two always use butter or coconut oil instead of vegetable oil. Both of these rule will ensure you have a rich and fluffy cake. 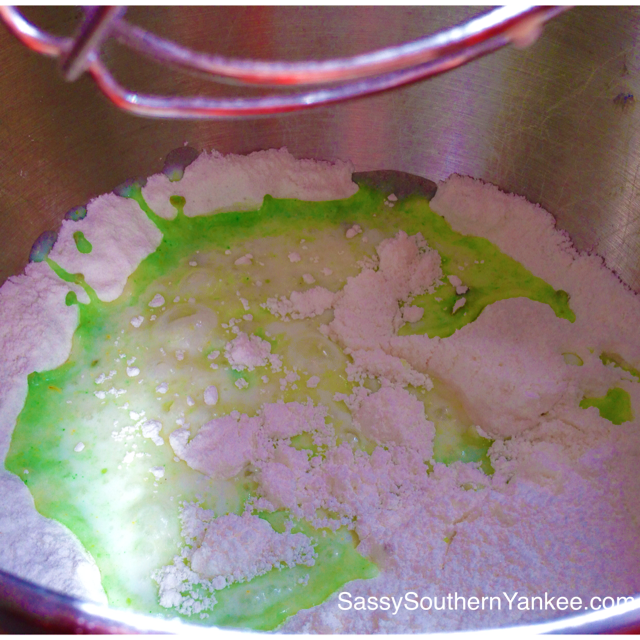 Lets get started on this yummy pistachio cake! Pre-Heat the Oven to 365* I have found over the years that cooking the cake at a lower temperature for a bit longer aids in it rising a bit better and making it a bit more moist. Grease your cake pan or prepare your muffin tins with liners. In a large bowl or using your standup mixer combine the cake mix, one box of instant pistachio pudding mix, eggs, oil or butter and 2/3 cup milk. Mix on low until the ingredients are combined then increase the mixer speed to high. Beat on high for about 3 min until the mixture is light and fluffy almost like whipped cream. The pudding along with the coconut oil cooling creates toms of air pockets in the batter helping it to rise in the oven. Pour the batter into the greased cake pan or the muffin tins. Bake according to the directions on the back of the cake mix; typically about 35 min for a cake and 18 min for muffins. Remove from oven once a toothpick or cake tester comes out clean. Allow the cake to cool completely. While the cakes cool we can get started on the frosting. This is by far my favorite part! For me the cake is just the vehicle for the pudding frosting 😉 Using your standup mixer or a good old fashion whisk and some elbow grease combine your last pack of instant pistachio pudding with the whipping cream. Mix together for a few minuets until the mixture starts to thicken. Once the pudding is starting to set fold in the non dairy topping. 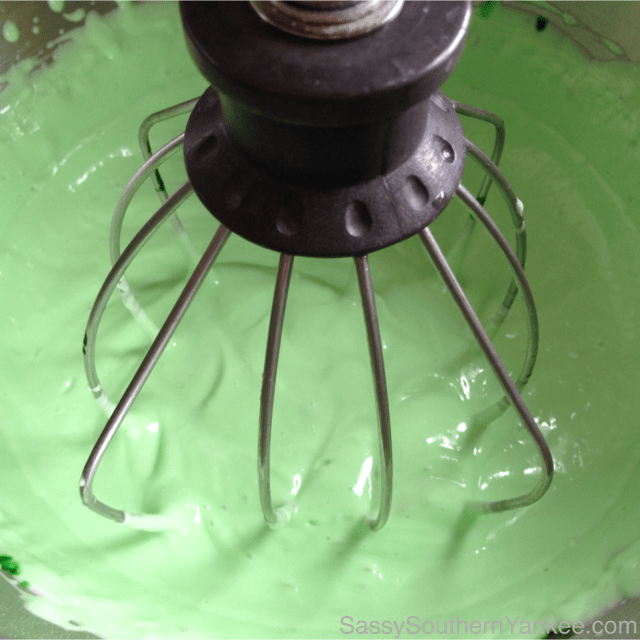 If you want your frosting a bit more vibrant you can add a bit of green food coloring to perk it up a bit. Allow the mixture to sit in the fridge for at least 10 min or longer if your cake is still cooking. Frost the cake with as much frosting as desired then enjoy! You can also top the cake with a few pistachios as garnish. Happy Early St. Patrick’s Day!! Spring is almost here, and so is St. Patrick's day! 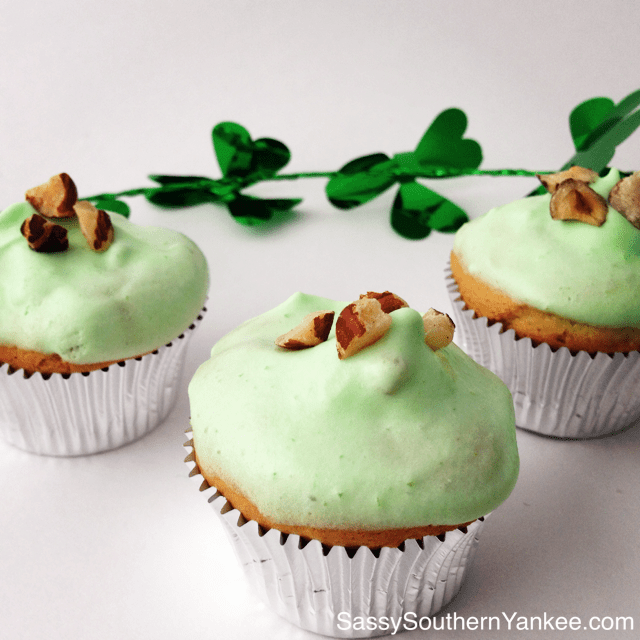 I figured with the time change this past weekend it would be nice to have a sweet treat to share on St. Patty's day that would be quick, and easy allowing for a bit more shut-eye. This pistachio cake is light, not too sweet plus its bright and cheery with the pale green. If you have little ones they will love watching the Leprechaun's "magic" when the milk hits the pudding turning the cake a bright green. In a large bowl or using your standup mixer combine the cake mix, one box of instant pistachio pudding mix, eggs, oil or butter and ⅔ cup milk. Mix on low until the ingredients are combined then increase the mixer speed to high. Beat on high for about 3 min until the mixture is light and fluffy almost like whipped cream. The pudding along with the coconut oil cooling creates toms of air pockets in the batter helping it to rise in the oven. Frost the cake with as much frosting as desired then enjoy! You can also top the cake with a few pistachios as garnish. Happy Early St. Patrick's Day!! 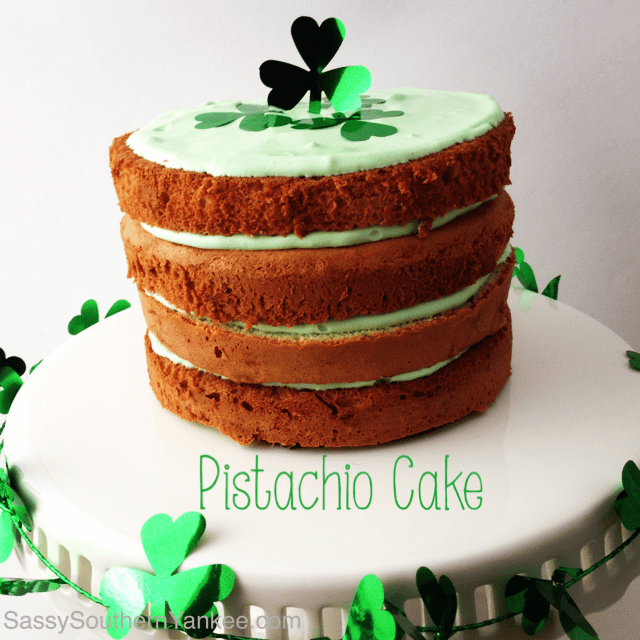 This entry was posted in Dessert and tagged Gluten Free, Pistachio, Pudding, St. Patrick's Day.